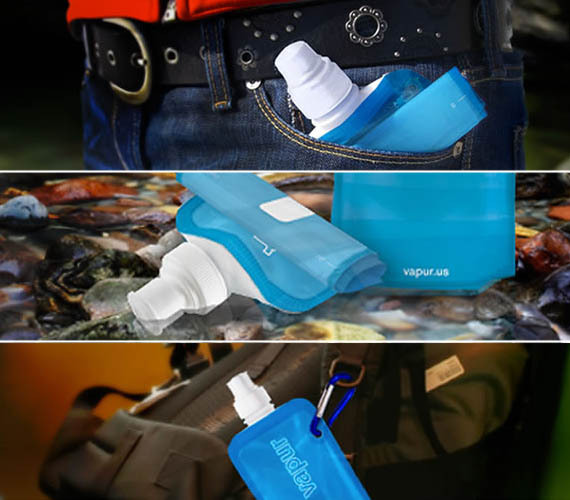 Vapur earns the nick name of Anti-Bottle in both design and attitude. More of a portable pouch than a bottle, it’s on a crusade to eliminate bottled water by bringing tap water to the front lines. Vapur stands like an ordinary bottle when full and can be rolled up or flattened when empty. (We don’t really have to point out the travel potential here.) Bring it biking, to the beach, to work and save the planet one less water bottle at a time. Just more food for the TSA attack dogs to pounce on. Boycott America!